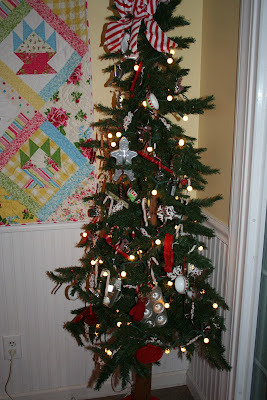 We continue the Christmas tour from the kitchen, one of the favorite rooms in my house. 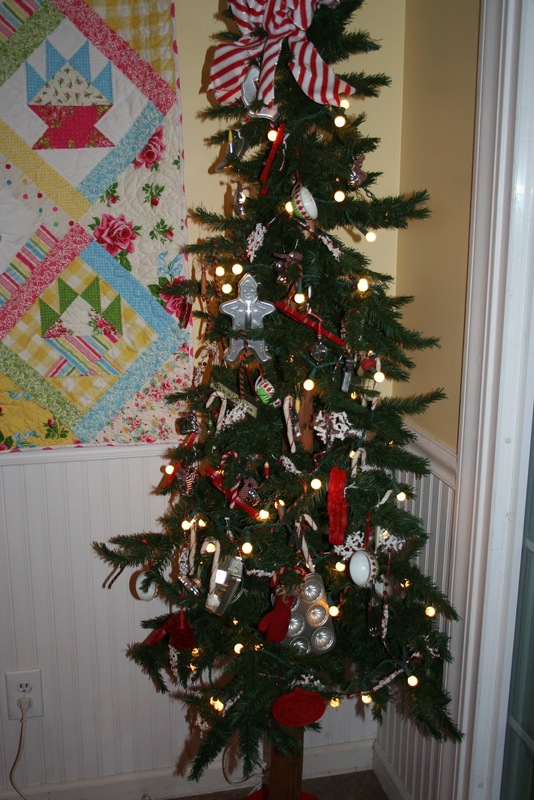 This tree hold my Grandmother's and Mother's cookie cutters as well as some miniature kitchen utensils, small tin teacups, snowflakes, candy canes and more. A girl can't go wrong when preparing meals on a pink kitchen island. Everyday is a holiday using this. 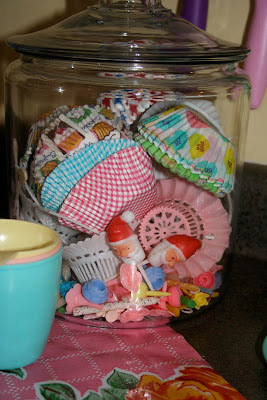 A big glass jar holds my collection of vintage cupcake picks, candle holders, candles and nut cups. I store my cupcake liners here as well. The measuring cups are a new find and yes, that is a pink one sandwiched in the middle. The little pink cupboard is prettified for Christmas with the addition of a tiny tree. I'm on the lookout for a stove to add to this piece. 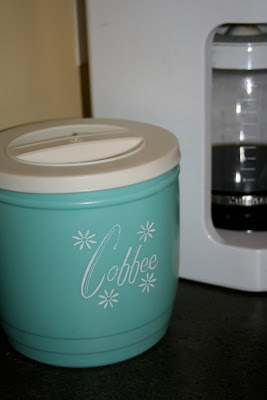 I'm loving the vintage container found this week. It holds my coffee liners and adds such charm to the coffee corner. 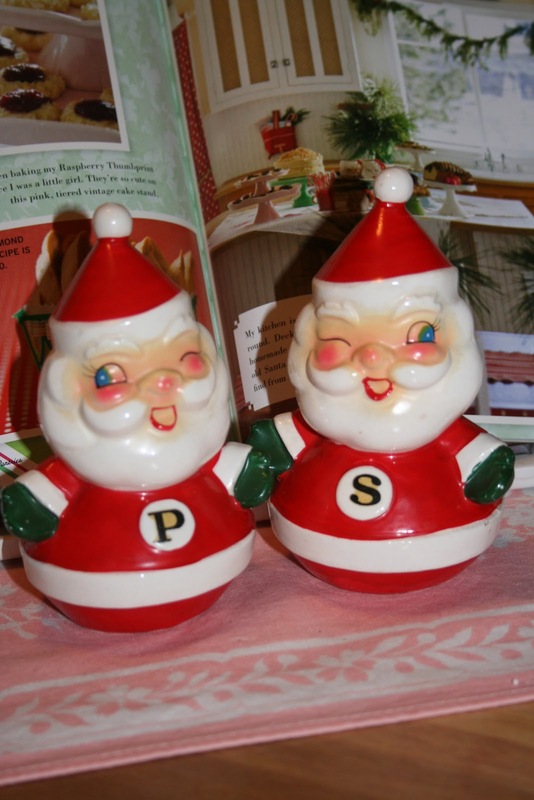 A little wink and a smile from some happy Holt Howard salt and pepper shakers. Oh how I love Holt Howard! Some sparkly pot holders from a local Christmas Bazaar add a homemade touch. I try to imagine the person who made them. My friend, Diane, made the little wreath and it ties the kitchen colors together so well. I'm off to make some coffee and start my day. A visit from my sweet niece is in order. I love that she's in her 20's and I'm still Aunt Nay! 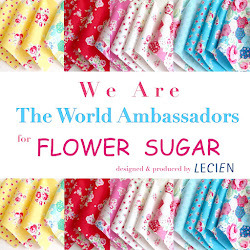 A thank you to Joyce for continuing to host Friday Pretties! She's off to visit her sister and cousins for a fun weekend. love all of your vintage pretties in your kitchen, renee. that little pink cupboard is darling. 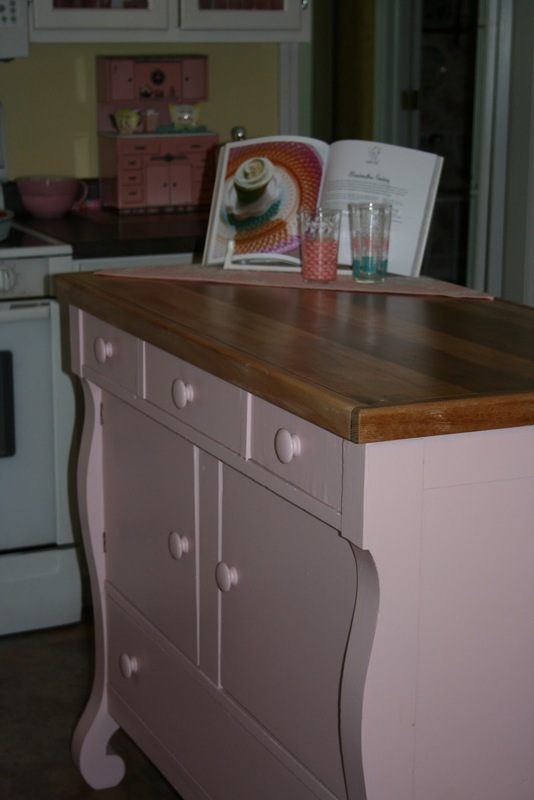 Hi Renee....i just had to tell you that i have the pink wolverine stove that matches your cupboard!...i posted about it last month on vintage monday. i had to giggle when you said that you were on the lookout for the stove...because i have been on the lookout for the cupboard! i love all of your vintage goodies in your kitchen...it also made me smile to see your little teapot tea bag holder...i have one just like it. i haven't seen the kitten one before...it's adorable! I love all your pinkilious goodies!! Vintage Chistmas charm!! I got a phone call this morning with this greeting..."Hey Aunt Cora" I love it too! Very sweet! I love your kitchen...I could just sit in there all day. It is SO pretty! Have a beautiful weekend full of sips of hot cocoa in that adorable kitchen!! Your kitchen is just gorgeous as it so cheerfully exudes the warmth and fun of the holiday season! 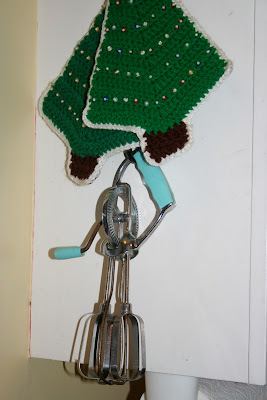 I love the idea of using your grandmother's cookie cutters for a kitchen tree. Such a special way to display a family treasure. I also really love your ideas for storing coffee filters and cute cupcake decorations. Blessings to you this holiday season! Love all your pretty things!!! Oh my Just as well I am sitting down, a person can only handle sew much gorgeousness! 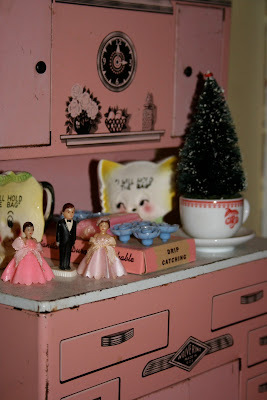 You know I think this has been the inspiration I needed to paint that little cupboard waiting patiently in the car shed I even have the pink paint! Have a great day!! !